Atlanta Auto Color Paint Matching. This is a great example of how Atlanta Auto Color can perform paint matching. Our paint technicians are extensively trained. They can make your car look and feel like new again. Our technicians are OSHA and EPA compliant. We only use high-quality material and the latest technology to ensure that we get a proper paint match with your existing car’s finish. We can match any paint color you have. We have our own paint facility and work on each car individually as if it were a piece of artwork, which we consider it to be. We are proud of the work we do. Have any other questions? Call us and we can answer any question that you may have to make you feel comfortable about who you hire to paint your vehicle. 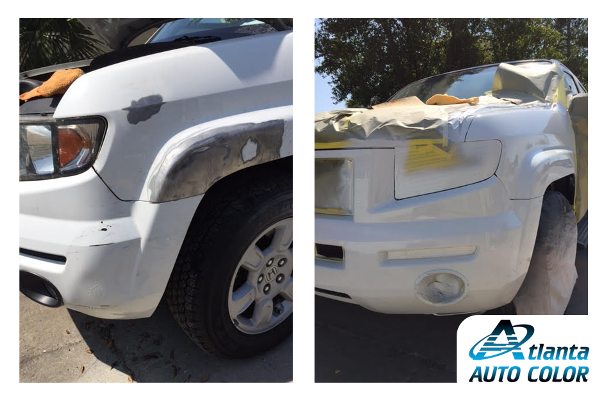 Trust us to show you how we can perform our magic and transform your car into the piece of artwork it can be.Atlanta Auto Color Paint Matching cannot be done well by just anyone. At Atlanta Dent, our sister company Atlanta Auto Color makes sure that every customer that comes through the door leaves happy and satisfied. Stop by our Roswell location for a free estimate. Insurance work is accepted too! You can also schedule an Uber ride through our website to and from our location, to help your busy life stay on track. We have technicians all over the Southeast. Here are some of our other GA locations and we also service a large part of Florida.